Lead-paint may cause serious injury or death to anyone who ingests or inhales it. Children who are overexposed to lead are particularly susceptible to injury, including learning disabilities, seizures, and other impairments of physical and mental development. Children under the age of six, who are at a vulnerable stage of development, may be at particularly serious risk of injury from lead exposure. If your child has suffered a lead-poisoning injury, you may be entitled to compensation from those responsible. Child lead-paint poisoning lawyer Jeffrey Killino is experienced in obtaining compensation for the families of children injured by lead poisoning. In 2007, he sued children’s toy manufacturer Mattel and forced the company to provide for lead testing of children who might have been injured by lead used in the production of Mattel toys. Call attorney Killino at 877-875-2927 to learn more about your legal options. Lead poisoning of children has been so frequently detected that the American Academy of Pediatrics (AAP) and the Center for Disease Control and Prevention (CDC) at one time recommended that all U.S. children have their blood tested, between age one and two, for the presence of lead. The presence of lead paint in older buildings and the known dangers thereof have led to the enactment of federal regulations intended to lessen the occurrence of lead-paint poisoning to inhabitants or users of these buildings. The Code of Federal Regulations, for example, imposes standards for the prevention of lead-based paint poisoning in certain residential structures, including the requirement that sellers or lessors of certain housing report the presence of any known lead-paint or lead-paint hazards to purchasers or lessees of property sold or leased. If a lessor (such as a landlord) or seller of a home knew or reasonably should have known of the presence of lead paint in the home or apartment unit, the individual or company that leased or sold the property may be held liable in a negligence action for lead-poisoning injuries suffered by a child of the buyer or lessee as a result. An owner or operator of a hotel or motel that contains lead-paint may be held liable for lead-paint poisoning suffered by a child who stays in the owner’s facility. The owners and operators of such businesses have a duty to exercise reasonable care for the safety of their customers, including the duty to make sure that facilities are free from toxic substances to which customers are likely to be exposed. Under certain circumstances, liability may attach to owners of property other than hotels and motels under the law of premises liability. In certain states, an owner’s liability under this legal theory may depend upon whether the child who sustained the lead-paint poisoning injury was an invitee, trespasser, or licensee at the time he or she was on the owner’s premises and gained exposure to the lead paint that resulted in injury. In some states, statutory law enacted to address the hazards of lead-paint poisoning imposes liability on sellers and lessors of property containing lead-poisoning hazards even if the seller or lessor had no knowledge of the presence of lead paint. 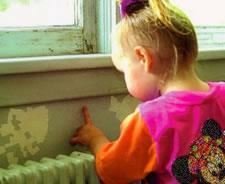 In some cases, the negligence of a supervisor may be found to have been a cause of a child’s lead-paint poisoning. If a child is cared for by a babysitter in the babysitter’s home, for example, and the babysitter is aware of the presence of lead paint in the home, the babysitter’s failure to ensure that the child does not gain access to the lead paint may result in liability on the part of the babysitter for lead-paint injuries sustained by the child while in the babysitter’s home. If your child has suffered a lead-paint poisoning injury, contact lead-paint poisoning lawyer Jeffrey Killino at 877-875-2927 for compassionate and experienced assistance in obtaining justice from the parties responsible for your child’s injuries.